Five dead birds and a sentinel chicken were added to the list of the animals that have tested positive for West Nile Virus in Contra Costa County, officials with the Contra Costa County Mosquito & Vector Control District confirmed Wednesday. The birds were found in Antioch, Alamo, Brentwood, Concord and Orinda and the chicken was in a coop in the Holland Tract near Knightsen, an unincorporated community in Contra Costa County. 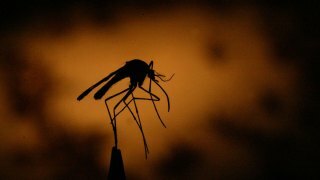 This year in Contra Costa County 12 birds, three chickens and mosquitoes from four samples tested positive for the virus, Contra Costa County Mosquito & Vector Control District spokeswoman Deborah Bass said. Those numbers reflect a typical non-drought year in the county, Bass said. Most of the positive tests have occurred in the northeastern part of the county, according to the district's website. This year in California one person has died. That person was a resident of Sacramento County. Nine other people in California have tested positive for the disease, but none of those people are residents of the Bay Area. Since 2005, 55 Contra Costa County residents have tested positive for the disease and two residents died of the disease in 2006.